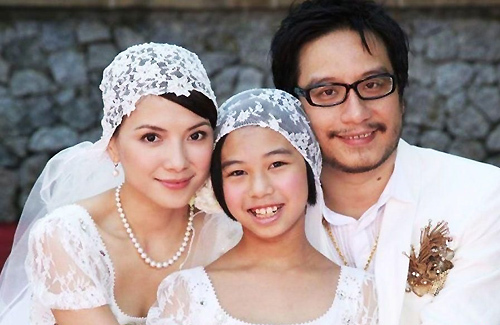 Director Oxide Pang’s (彭順) infidelity in his marriage not only hurt his wife Angelica Lee (李心潔), but also his teenage daughter, Yan Yan (欣欣), whom was born to his ex-wife. When his nearly year-long affair with 26-year-old model Liddy Li (李悅彤) was publicly exposed, Yan Yan was allegedly extremely upset with her father’s unfaithful behavior. Although Yan Yan is not Angelica’s biological daughter, Angelica treats her as her own child. While dating Oxide, Angelica already took the role of stepmother and helped take care of Yan. After their marriage in 2010, Angelica resided in Malaysia to raise Yan Yan while Oxide was primarily based in Hong Kong to aid his film-making career. Throughout the years, Yan Yan shared a close and loving relationship with Angelica. When she found out her father had cheated on Angelica, Yan Yan felt hurt and failed to understand his actions. Soon after the cheating scandal was exposed, Angelica’s parents flew to Kuala Lumpur to stay with their daughter. In an interview, her younger brother indicated that their entire family shows full support towards Angelica. However, since the issue is between Angelica and Oxide, the Lee family hopes the press will allow space for the couple to resolve the matter on their own. Karena shouldn’t be giving support to Angelica, as she is a marriage wrecker herself. I am surprised jaynestar didnt have news on yang mi and hawick bb girl yet. Baby girl? I thought they were having a boy? Hawick himself announced the welcoming of his baby girl yesterday. Oh really? Most of the reports that I have read all say that they are expecting a boy. I guess we shall find out soon. They could be throwing us all off.